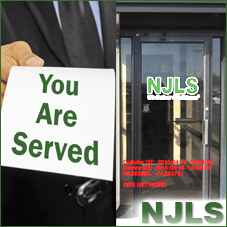 Effective November 12, 2018, NJLS’s Process Service business has merged with its sister company, PM Legal. The work will continue to be handled daily by the same NJ team, in the same locations in Union and Cherry Hill, New Jersey, using the same servers across the state, at the same price. As the largest process server in the New York metro area, PM uses advanced technology to track and monitor its work in the field, assuring the best client service. NJLS courier operations will continue as NJLS. PM Legal handles requests not only in New Jersey but also all over the United States and the world, with full-time process servers and providing clients with online tracking showing all service attempts, and an instant view of the affidavit of service. In New Jersey, PM Legal’s online process service system captures the location and time of attempted or completed serves with GPS (global positioning system) coordinates and a photograph of the physical address where the serve occurred. In New Jersey alone, PM Legal has more than a dozen professional process servers working 24/7—many of them notaries public—and has partnerships with hundreds of process serving agencies across all 50 states and around the world. In addition to service of process as well as filing, efiling and document retrieval, PM Legal offers skip tracing.